After more than a year of anticipation, Chrysler has taken the wraps off the Drag Package for the 2008 Dodge Challenger (Read our three-part review of the SRT8 here!). At least 100 of the Mopar muscle machines will be built, each tailored for the specific NHRA category in which the buyer wishes to compete. The big decision will be whether you want a 5.9-liter Magnum wedge, 5.7-liter Hemi or the big 'n nasty 6.1-liter Hemi. Any of them can be paired with either a manual or automatic transmission. Full details in the press release below the jump. The Drag Package Challengers are also stripped down and fitted with lightweight components like a composite lift-off style hood, which also comes in handy if you want to disturb the peace in your neighborhood. Of course, the cars won't be street legal, so if you want to cruise Woodward, you'll be asking for trouble. Center Line, Mich., Jul 13, 2008 - Mopar® is bringing the iconic Dodge Challenger muscle car to National Hot Road Association (NHRA) drag-racing competition. Mopar revealed two Dodge Challenger Drag Race Package Cars at the 29th Annual Mopar Mile-High Nationals today before thrilled fans at Bandimere Speedway in Morrison, Colo. Mopar Mile-High Nationals is the longest-running NHRA sponsorship. "Big Daddy" Don Garlits and Judy "Miss Mighty Mopar" Lilly were behind the wheels for their inaugural track run. Garlits drove the car featuring the Stone White paint scheme. Lilly was behind the wheel of the "Mopar Liquid Metal" prototype. NHRA named Garlits the #1 driver of the Top 50 drivers from its first 50 years. His victories and accomplishments are virtually unmatched in drag-racing history. "Miss Mighty Mopar" is one of the female pioneers in drag racing. Spending 12 years on the NHRA circuit, Lilly is the only female driver to win two NHRA national events in one year. Mopar built the first two Challenger Drag Race Package Cars for development and testing for its new Challenger Package Car program. Based on the Challenger SRT8®, the prototypes were finished in Stock Eliminator configuration. They ran successfully in June 2008 as proof-of-concept and for NHRA certification. Mopar dropped approximately 1,000 lbs. off the production Challenger SRT8 by eliminating major production components and systems. To accentuate the weight savings, they also feature added composite, polycarbonate and lightweight components designed for drag racing that will be part of the new Package Car program. The engine was repositioned to improve driveline angle and weight distribution. The 116-inch wheelbase was shortened by ½ inch. They also feature a front cradle with bolt-in crossmember and solid engine mounts. "Today is a great day for Mopar, Dodge, SRT, drag racers and motorsports enthusiasts everywhere. Not made for the streets, our drag-race-only Challengers will be running soon in NHRA competition—the best grassroots racing series in the world," said Sunil Lahoti, Mopar Marketing and Brand Manager, Chrysler LLC. "And who better to drive our new Challenger Package Cars on their inaugural track run than 'Big Daddy' and 'Miss Mighty Mopar'—the greatest drag racer of all time and a female pioneer of the sport." The first drag-race, factory-prepped package cars built in 40 years, the new Challenger Drag Race Package Car by Mopar builds on the heritage of the limited-edition 1968 HEMI®-powered Package Cars. Those '68 Dodge Darts and Plymouth Barracudas solidified the Mopar brand as a quarter-mile force. 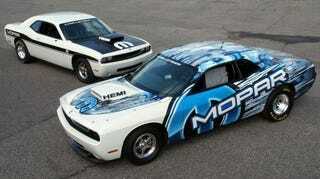 Mopar will build a minimum of 100 Challenger Drag Race Package Cars to meet NHRA requirements. Based on the production Dodge Challenger SRT8, Mopar's modern factory-prepped Challenger Drag Race Package Car will begin as a special Body-in-White (BIW) from Chrysler's Brampton, Ontario, Canada, assembly plant. The body sealer, sound deadener and undercoat will be eliminated. To reduce vehicle weight, major production component and systems will also be eliminated including: windshield wiper assembly, complete HVAC system, all airbag components, rear seats, power steering system, exhaust system and underbody heat shields, cross-car and side impact door beams, rear bumper beam and rear deck lid spoiler. The drag racer has three engine options—6.1-liter or 5.7-liter HEMI or 5.9-liter Magnum® Wedge—as well as manual or automatic transmission. A build book/owner's manual will be provided to document the modifications made to the Challenger SRT8 as well as provide recommendations to finish the Package Car for Stock Eliminator competition. To accentuate weight savings, there are unique drag-race components in the Package Car program including: composite lift-off hood with functional scoop, Viper-style front seats, polycarbonate door windows, lightweight cooling module with electric fan, manual rack and pinion steering, special cable-operated deck lid release, special lightweight front brake assembly and special cable-operated throttle linkage and pedal assembly. The Challenger Drag Race Package Car will be eligible to run in three Eliminator categories—Comp, Super Stock and Stock—and potentially 40 classes. Depending upon the configuration selected, the U.S. Manufacturer's Suggested Retail Price (MSRP) for the Challenger Drag Race Package Car program will range from the low to mid $30s. Each car will carry an identification plate with sequential serial number. The Challenger Drag Race Package Car will be available for order in late August to early September. A toll-free number will be designated for ordering. Details will be posted on www.mopar.com. Now in its fifth decade, NHRA is the world's largest motorsports sanctioning body with 80,000 members, 140 member tracks, more than 35,000 licensed competitors and more than 5,000 member-track events. NHRA is second only to NASCAR in terms of fan attendance. When Chrysler bought Dodge in 1928, the need for a dedicated parts manufacturer, supplier and distribution system to support the growing enterprise led to the formation of the Chrysler Motor Parts Corporation (CMPC) in 1929. Originally used in the 1920s, Mopar (a simple contraction of the words MOtor and PARts) was trademarked for a line of antifreeze products in 1937. It was also widely used as a moniker for the CMPC. The Mopar brand made its mark in the 1960s—the muscle car era. The Chrysler Corporation built race-ready Dodge and Plymouth "package cars" equipped with special high-performance parts. Mopar carried a line of "Special Parts" for super stock drag racers and developed its racing parts division called Mopar Performance Parts to enhance speed and handling for both road and racing use. Today, Chrysler LLC's Global Service & Parts division is responsible for the manufacturing and distribution of nearly 250,000 authentic Mopar replacement parts, components, restoration parts, accessories and performance parts for Chrysler, Jeep® and Dodge vehicles sold around the world. To assure quality, reliability and durability, all Mopar parts and accessories are designed in strict adherence to Chrysler engineering standards.